Marxist Green MP and his socialist sister, Maire Leadbetter (centre) at today's anti Guantanamo Bay protest in Auckland. This is one of the very few issues that yours truly would agree with Keith Locke on. The US incarceration of suspected Al Qaida supporters at the US Naval base at Guantanamo is a complete disgrace. The prisoners should be charged or released. Now! That's Graeme Easte, 2nd on the left, her partner and Keith Locke's sister Maire Leadbeatter in the middle. Unsure about the chap on the far left (aren't they all!). That Bhatnager knows his peeps. I should say that Easte is a Western Bays community board member for City Vision (the Labour,Alliance,Green coalition), and despite his hard left background actually not a bad chap to chat with. Maire Leadbeatter, his partner, is a former councillor for Auckland City (again with City Vision) and unsuccessfully stood for the ARC at the previous election for this ticket. Locke is as daft on this issue as any. Using the law to fight terrorists is a futile and senseless endeavour. 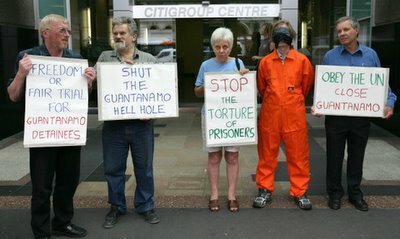 (its what Bill Clintom preferred).. Let those scum out at Guantanamo and they're straight back to murdering innocents..
^^ Well when the eyes of the White House turn on your own liberty don't come crying to me that the rule of law has been given the arse in favour of the rule of man. Because you just arsed it! Internment has been used often by all kinds of governments in times of war. This is a war against terrorists. This is not a question of ideology, this is a question of controlling inhuman murderers who only use freedom to destroy freedom. Your analogy is senseless crap. Aaron beat me to the Easte disclosure. I hassle him about the latest local problems whenever I bump into him. Inoffensive but too much part of the ticket system and the bureaucracy. I think he is the Chairman of the community board now - all members are city vision - ouch! The US is either freeing prisioners or will be sending them to trial in military court. The US is perfectly within its rights and in accordance with the Geneva convention at Guantanamo, as the UN would have realised if they actually employed anyone with half a brain to prepare their report. Try reading it yourself, look for "Illegal Combatants". Those protesting against it are simply either proto (or actual) fascists or so far gone in anti-americanism that they acting on reflex and haven't thought at all. While whole-heartedly agreeing with the detention of actual enemy combatants, Guantanamo Bay seems to have caught far more innocent people in dragnets than actual terrorists. A recent review of detainees picked up in the Afghan campaign found most of the detainees were not picked up on the battlefield in Afghanistan. The vast majority were instead captured in Pakistan. 75 percent are not accused of taking part in hostilities against the United States. The data suggests that maybe 80 percent of these detainees were never al-Qaida members, and many were never even Taliban foot soldiers. And another recent study found 55 percent of the detainees are not suspected of having committed any hostile acts against the United States and that 40 percent of the detainees are not affiliated with al-Qaida. Further, 86 percent of detainees percent were captured either by the Northern Alliance or by Pakistan "at a time in which the United States offered large bounties for capture of suspected enemies." Only two detainees have being charged - and none convicted - in the three years Guantanamo has been operating. I agree, let the buggers go, but microchip them with traceable GPS chips, and if they go back to terrorist activities send them a parting gift of a nice cruise. Perhaps they could even try the manchurian candidate in reverse. Sorry Trev, this is not a law & order issue. These are enemy combatants, and in war the rules are different. They'll be released when their side surrenders.